Table Toppers is the Art Center of Waco's annual fundraiser, benefitting the art education and exhibits locally in our city. Businesses and organizations around Waco design elaborate table decorations that creatively represent their business or organization. The guests enjoy a champagne luncheon while taking in all of the wonderful creations and merchandise at each table. Not only was I able to participate in creating a table this year, but because Table Toppers was celebrating their 20th anniversary I was asked to design the visual brand graphics and marketing material for this year's event. I wanted to design a very simple and "classic" logo that could stand the test of time as this fundraiser continues into the future. In thinking about the 20th anniversary, I played with the idea of incorporating some lily flowers into the logo for special touch, but it began to take on a very feminine look. The logo represents the entire event and therefore it needed to appeal to both men and women, so the liles were scratched. Another symbol that represents the 20th anniversary is the emerald, which worked well as a bold design element that could appeal to both men and women. 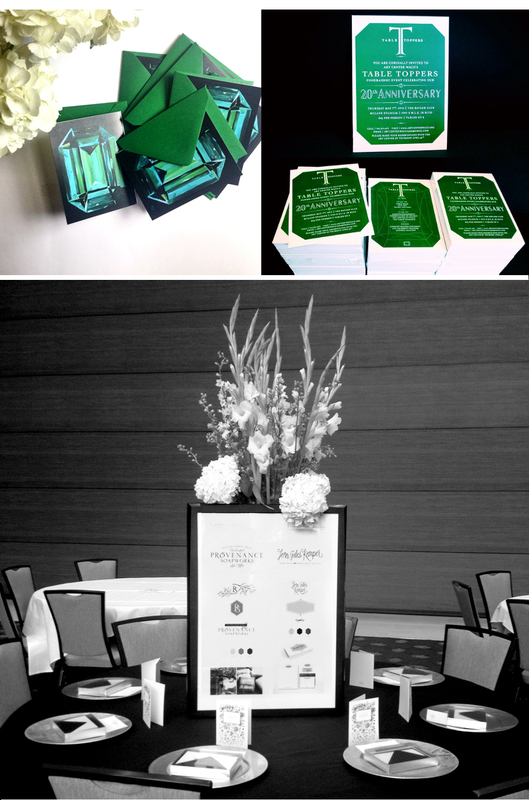 I ended up incorporating emerald elements throughout the details of the event branding. I was very pleased to see how of each piece from the invitations, to the programs and all the signage came together in such a cohesive way to really elevate this special celebration year.